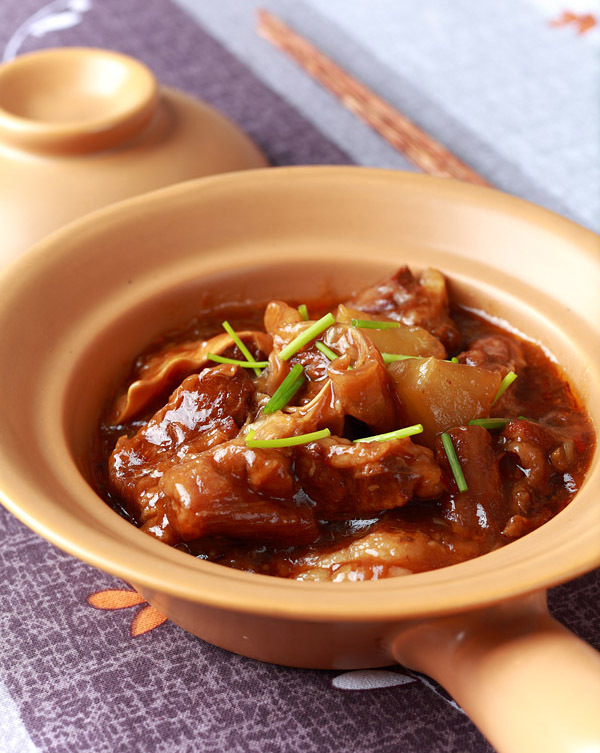 Braised beef stew is a very classic Cantonese dish. The dishes in generally appear at festive banquets. The stew had deep colors and rich flavors. It is a dish won’t easily be forgotten. The first time I ate this dish was an evening in Guangzhou. On the way home with my husband, I was deeply attracted by the smell of beef, I couldn’t resist the temptation. Now it is one of my favorite meals! One of my preferred ingredients is the radish. 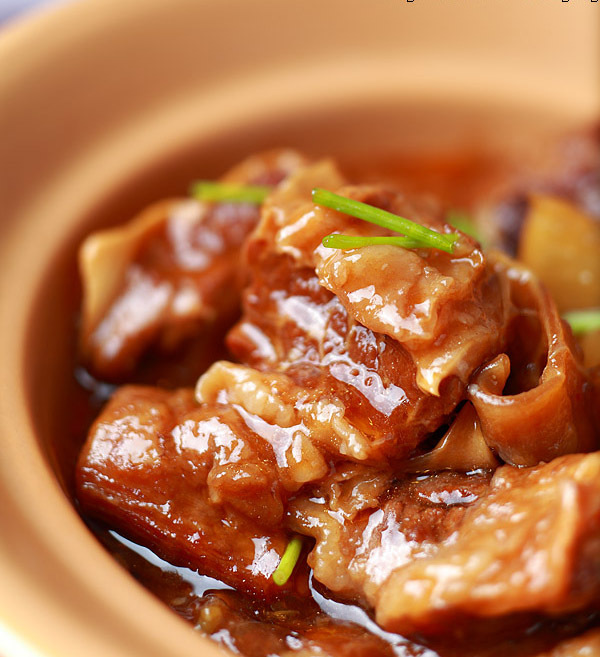 It is delicious and very healthy, also it helps round out the whole dish. 1. First the seasoning- The most important thing about this dish is Chu Hou Paste. Bean paste is used to add flavor, but if it is too spicy, you can omit this. 2. 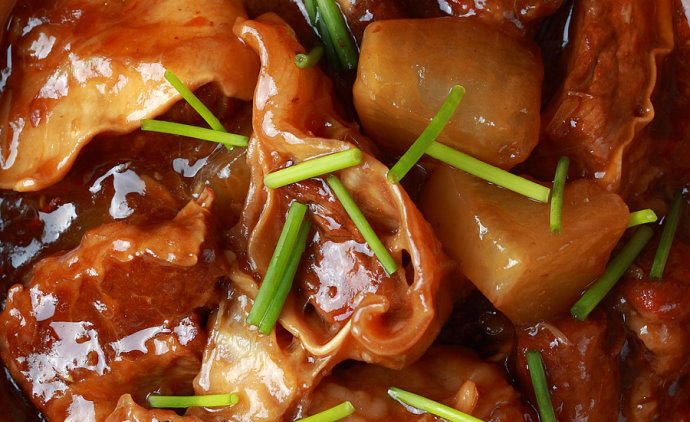 The green onion, ginger, and garlic are best to be lightly stir-fried first and then stewed with beef, so that the flavors and aromas pop out. 3. When selecting the meat, it is best to choose a piece that has some fat on it, it will be much more flavorful. 4. The beef is best braised by putting it in cold water first, and then bringing to a boil. 5. When cooking, it must be on low heat. It is also important to keep the lid on when stewing, so that the moisture doesn’t evaporate. 6. The radish must be stewed with the beef for the whole 20 minutes, or it may not get cooked all the way. 7. 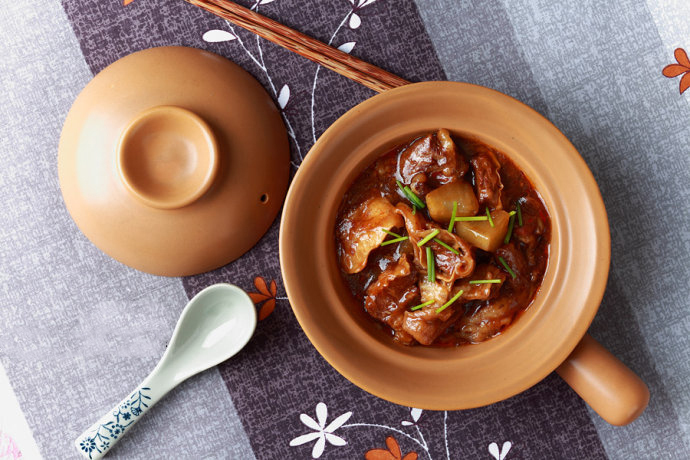 If the taste of radish is too strong for you, you can boil it in water and then put it into the beef stew, so the taste is not overwhelming. Step 1. The meat is washed and cut into large pieces of 4-5 cm. Step 2. Cut green onion, ginger, and garlic into small pieces. Step 3. Wash and peel the radish, cut into large square pieces. Step 4. Blanch beef, ginger, and green onions. Remove it after about 2 minutes and separate the ginger and green onion from the beef. Step 5. Pour a little oil into the pot. 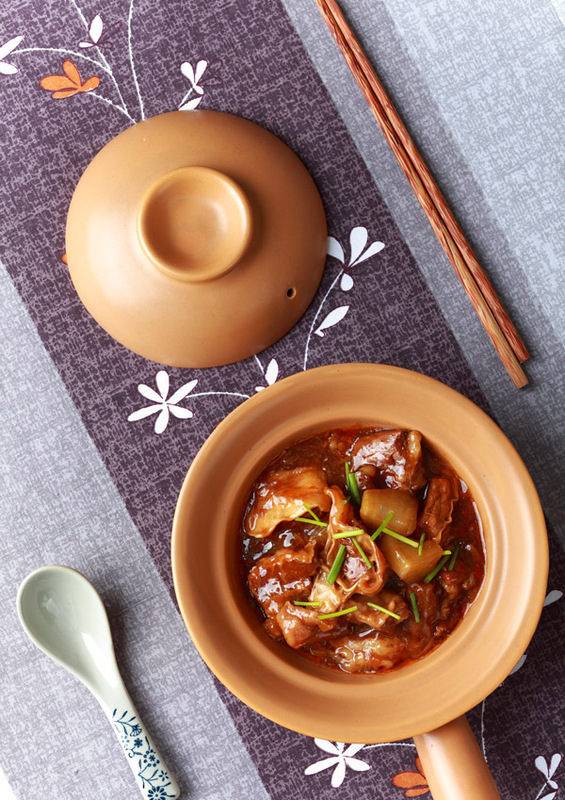 On low heat, stir fry doubanjiang for 10 seconds, add the Chu Hou Paste and stir-fry. Using the picture below as a reference, fill the pot with water and bring and the heat up. Step 6. After the water begins to boil, add the blanched beef, cooking wine, light soy sauce, oyster sauce, sugar and all spices. After boiling a few minutes, transfer to another new pot. Step 7. Put a good amount of oil in the pot, put the ginger, green onion and garlic, stir-fry (do not fry for too long). Step 8. Pour the fried ginger and green onion into the beef, stir well, bring to a boil over high heat, turn the heat down to low and then cover and simmer for two hours, try to keep the lid slightly cracked open. Step 9. In the last 20 minutes of the beef stew, add the radish and simmer for 20 minutes. Step 10. You can eat it as is, or you can add your favorite vegetables such as cabbage, spinach, etc., and cook for a few minutes.